The first intensive, close-up investigation of the practice and teaching of religion at American colleges and universities, Religion on Campus is an indispensable resource for all who want to understand what religion really means to today's undergraduates. 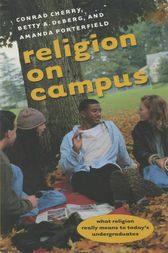 To explore firsthand how college students understand, practice, and learn about religion, the authors visited four very different U.S. campuses: a Roman Catholic university in the East, a state university in the West, a historically black university in the South, and a Lutheran liberal arts college in the North. They interviewed students, faculty members, and administrators; attended classes; participated in worship services; observed prayer and Bible study groups; and surveyed the general ethos of each campus. The resulting study makes fascinating and important reading for anyone--including students, parents, teachers, administrators, clergy, and scholars--concerned with the future of young Americans. Challenging theories of the secularization of higher education and the decline of religion on campus, this book reveals that both the practice and the study of religion are thriving, nourished by a campus culture of diversity, tolerance, and choice.